Charge 2 Smartphones at the same time. Where else can you perform both Smartphones charging at the same time? Each USB socket provides 1 amp allowing fast charging for both mobile phones. Overload protection and self reseting included in charger. Cables can also be used with a computer or other USB chargers. 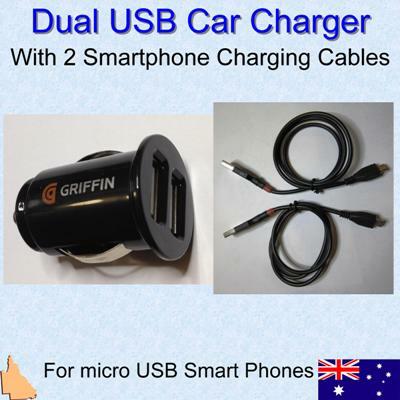 Car charger is very compact design with less than 10 mm protruding from the socket. Each cable 90 cm in length. 5 Volts. This is the USB standard. 2 Amps. Charge 2 smartphones fast. Yes, from 2.4 Amps. Self resetting. Power GPS, MP3 player, iTouch, 1 iPad, some 5 volt tablets. Cables 90 cm in length.